I am sure most of us remember opening our first bank account. I was not yet 18, I had finished school at Gormanston College, Co Meath, and for a few months I was working with the Insurance Corporation of Ireland. My father was an insurance and property surveyor, then working with the Royal Insurance Company, and he had hopes that I would train as a Chartered Surveyor. I began working the Insurance Corporation of Ireland on Dame Street in late 1969, and within the first week I was sent down the street to the Royal Bank of Ireland, tucked away in Foster Place, to open my first bank account so I could be paid. Perhaps if I rummaged around, I might still fund my first account book, with its impressive red cushioned covers and luxurious gold lettering that provided a regal presence for the inside pocket of my jacket. The Insurance Corporation of Ireland has long gone from Dame Street. The Royal Bank of Ireland was still trading under its old name in 1969 although it had been sucked into the new, larger and brasher Allied Irish Banks three years earlier. But its name is now forgotten, and the AIB branch on Foster Place closed in 2002. But I found myself back in this building late last week when I took part in a seminar on dissertation supervision organised for academic staff members from both Trinity College Dublin and University College Dublin. The former Royal Bank building was acquired by TCD after it closed as a bank branch. Outside the building is covered in cladding and scaffolding, and it is difficult to imagine and impossible to see its former grandeur. Foster Place is a sleepy, cobble-stoned, tree-lined plaza, dominated on the east side by west flank of the former Parliament House, now the Bank of Ireland. But its inherent charm is hidden by the taxis that clog up the small area. The exterior of the former Bank of Ireland is straight-forward classicism with a good neo-classical porch added in 1850. But once I was back inside on Friday afternoon I recalled how the interior of this building so important architecturally, for this was once the finest banking hall in Dublin. The Royal Bank of Ireland was established in 1836, and at first was known for its mercantile links. A year later, Shaw’s Bank merged with the Royal Bank in 1837. In 1923, the Royal Bank of Ireland bought the Irish Free State business of the Belfast Banking Company, which in turn bought the Northern Ireland business of the Royal Bank. In 1966, the Royal Bank was merged with the Provincial Bank of Ireland (1825) and the Munster and Leinster Bank (1885) to form the Allied Irish Banks (AIB). A double height entrance hall creates a barrier between the banking hall and the street. This banking hall was added by Charles Geoghegan in 1859 at the rear of the building. It is a coffered barrel-vaulted space that is top lit and supported by cast-iron Corinthian columns. But the first architect of this building was George Papworth (1781-1855) of Dublin. He was born in London, a son of the English stucco artist John Papworth. In 1796, when he was still only 15, Papworth exhibited a design for a bath at the Royal Academy. When his father died in 1799, Charles became the pupil of his elder brother, John Buonarotti Papworth (1775-1845), and worked as his clerk of works until 1804. He then moved to Northampton, where he worked in the office of the architect Luke Kershaw. In May 1806, Papworth moved to Dublin to take charge of a company on North Strand that operated Sir George Wright’s patented system for producing stone tubes for pipes. Meanwhile, he continued to work as an architect in in Dublin, and his early patrons included the Earl of Westmeath, Viscount Gormanston, and a Mr Macklin, for whom he designed a Gothic entrance. After the stonecutting company was sold in 1812, he designed a sawing machine and a pump, and also gained a reputation as an arbitrator. In 1837, Papworth was appointed architect to the Ecclesiastical Commissioners for the province of Connaught, and he held this post until 1842. He was also architect to the Dublin and Drogheda Railway Company and to the Royal Bank of Ireland. He played an active role in the affairs of the Royal Hibernian Academy, where he was Professor of Architecture from 1845. Papworth died in Dublin on 14 March 1855. He had married Margaret Davis in 1808, and their sons included three well-known architects, John Thomas Papworth, Collins Edgar Papworth, and Charles William Papworth. Papworth’s great works include the giant Corinthian portico he designed for Sir Roger Palmer of Kenure Park in Rush in north Co Dublin in 1842-1844. He also designed Kenure Parish Church and some houses on the Palmer estate, railway stations in Drogheda, Kells and Balbriggan, and some features in the Kildare Street and University Club on Saint Stephen’s Green, as well as the Quaker Meeting House in Monkstown, Co Dublin. 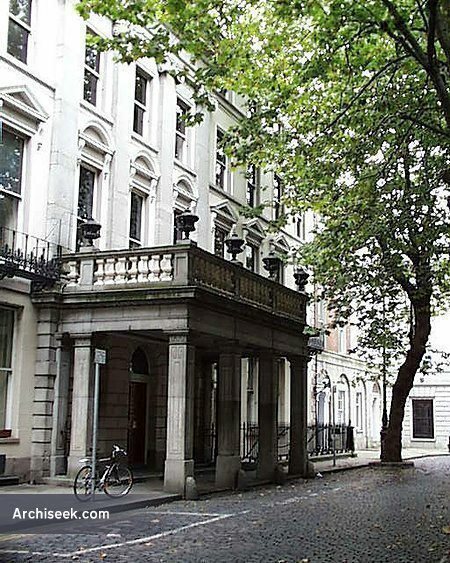 George Papworth designed the Greek revival porch of the Royal Bank of Ireland in Foster Place around 1840 when these were the premises of the Hibernian United Services Club, the successor to the former Daly’s Club. Inside, however, most of the work is by the Dublin architect and engineer Charles Geoghegan (1820-1908). Charles Geoghegan was a son of Thomas Geoghegan, a linen draper, and he trained first as an engineer. When he was still a young man he went to London, and worked on the new railway line between Bristol and Bath before where he decided to become an architect. He returned to Dublin in 1851 and continued to practice as an architect for over 40 years, designing commercial, industrial, and domestic buildings for a clientele chiefly drawn from Catholic commercial and professional circles. Throughout his career he was also was employed by the Royal Bank and he was architect to the Industrial Tenements Company. He retired ca 1894, although he continued to take a deep interest in architectural affairs. He died at his home at 89 Pembroke Road on 26 June 1908 and was buried in Glasnevin Cemetery. In 1858-1860, Geoghegan designed the new bank premises for the Royal Bank in the former clubhouse in Foster Place. He retained Papworth’s façade and portico, but inside the building is dominated mid-Victorian stucco, and the rich, cast-iron piano nobile balcony. In her Pevsner architectural guide to Dublin (2005), she says this is “an antidote to the halls of Deane, Drew et al” (page 420). With its cast-iron colonnades glazed and coffered vaults and enormous central counter, she says this is Dublin’s most engaging banking hall. In 1866, Geoghegan also designed the Italian Gothic former Royal Bank on north side of High Street, and in 1869 he remodelled a pair of Georgian houses at 63-64 Sackville Street (O’Connell Street) for the Royal Bank too. That was 100 years before I opened my first bank account in his Royal Bank in Foster Place which I found myself revisiting last week.